The coast and beyond, including map of the New Zealand continent from ^ Figure 8.1: New Zealand in relation to the Indo-Australian and Pacific Plates. The State of New Zealand’s Environment 1997 (1997). Retrieved on 2007-04-20.
a b Keith Lewis; Scott D. Nodder and Lionel Carter (2007-01-11). 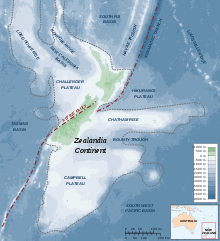 Zealandia: the New Zealand continent. Te Ara — the Encyclopedia of New Zealand. Retrieved on 2007-02-22. Mortimer, Nick (2006), «Zealandia», Australian Earth Sciences Convention, Melbourne, Australia, гг. 4. Figure 4. Basement rocks of New Zealand. UNCLOS Article 76: The Land mass, continental shelf, and deep ocean floor: Accretion and suturing. Retrieved on 2007-04-21. Flannery, Tim (1994). The Future Eaters. Grove Press, New York. Pages 42-43.